Harry St. John Bridger Philby CIE (April 3, 1885 – September 30, 1960), also known as Jack Philby and Sheikh Abdullah, was an Arabist, explorer, writer, and British colonial office intelligence operative. He was born at St. John's, Badulla, Ceylon and educated at Trinity College, Cambridge, where he studied Oriental languages under E. G. Browne and was a friend and classmate of Jawaharlal Nehru, later Prime Minister of India. Philby's son Kim Philby became famous for being a British intelligence agent who was a double agent for the Soviet Union. As he states in his autobiography, he "became something of a fanatic" and "the first Socialist to join the Indian Civil Service", and was posted to Lahore in the Punjab in 1908. He acquired fluency in Urdu, Punjabi, Baluchi, Persian, and eventually Arabic. Philby married his first wife in September 1910, with his distant cousin Bernard Montgomery, later commander-in-chief of the British Army during World War II, serving as best man. Philby is one of the lesser-known but most influential persons in the modern history of the Middle East. In late 1915 Percy Cox, chief political officer of the small British Mesopotamian expeditionary force, recruited Philby as head of the finance branch of the British administration in Baghdad, a job which included fixing compensation for property and business owners. Their mission was twofold: (1) organize the Arab Revolt against the Ottoman Turks; (2) protect the oilfields near Basra and the Shatt al Arab, which was the only source of oil for the Royal Navy. The revolt was organized with the promise of creating a unified Arab state, or Arab Federation, from Aleppo in Syria to Aden in Yemen. Gertrude Bell of the British Military Intelligence Department was his first controller and taught him the finer arts of espionage. In 1916 he became officiating Revenue Commissioner for Occupied Territories. 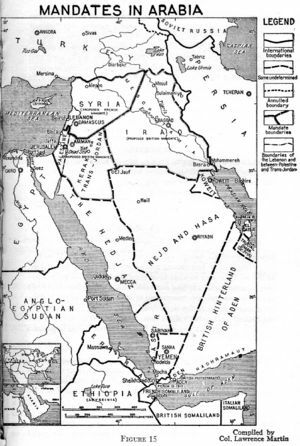 In November 1917 Philby was sent to the interior of the Arabian Peninsula as head of a mission to Ibn Saud. The Wahabbi chieftan and bitter enemy of Sherif Hussein was sending terrorist raids against the Hashemite ruler of the Hejaz, leader of the revolt. For more than 700 years the non-Turkic Hashemite dynasty held title as Sharif of Mecca. Philby secretly began to favour Ibn Saud over Sherif Hussein as "King of the Arabs", a difference with British policy, which was promising support for the Hashemite dynasty in the post-Ottoman world. On return Philby completed the crossing from Riyadh to Jeddah by the "backdoor" route, thus demonstrating Ibn Saud was in control of the Arabian highlands, whereas Sherif Hussein could not guarantee safe passage. Later he was awarded the Royal Geographical Society Founders Gold Medal for the desert journey. Back in Jeddah he met with an embarrassed Sherif Hussein. On 7 November 1918, four days before the Armistice, Britain and France issued the Anglo-French Declaration to the Arabs assuring self-determination. Philby felt the betrayal of this assurance, along with the Balfour Declaration and other diplomatic manouvres broke faith with the promise of a single unified Arab nation in exchange for aligning themselves with the Allies in the war against the Ottoman Turks and Central Powers. Philby argued that Ibn Saud was a "democrat" guiding his affairs "by mutual counsel" as laid out in the Koran (Surah XLII. 37), in contrast to Lord Curzon's "Hussein policy". British policy on Arab affairs was wracked by rivalries between the Foreign Office and the India Office. After the Great Iraqi Revolution of 1920 Philby was appointed Minister of Internal Security in the British Mandate of Iraq. He roughed out a democratic constitution complete with elected assembly and republican president. In November 1921 Philby was named chief head of the Secret Service for the British Mandate of Palestine, or what is now all of Jordan, Israel, and Palestine. He worked with T. E. Lawrence for a while, but did not share Lawrence's views on the Hashemites. Here he met his American counterpart, Allen Dulles, who was stationed in Istanbul. At the end of 1922 Philby travelled to London for extensive meetings with all involved in the Palestinian question. They were Winston Churchill, King George, the Prince of Wales, Baron Rothschild, Wickham Steed, and Chaim Weizmann, the head of the Zionist movement. Mandates in Arabia in 1920. Philby was of the view that both British and the Saudi family's interests would be best served by uniting the Arabian peninsula under one government from the Red Sea to the Persian Gulf, with the Saudis supplanting the Hashemites as Islamic "Keepers of the Holy Places" while protecting shipping lanes on the Suez–Aden–Bombay route of the British Empire. Philby was forced to resign his post in 1924 on differences of allowing Jewish immigration to Palestine. He was found to be in unauthorized correspondence with Ibn Saud, which carried with it the connotation of espionage, sending information he gained in his post to Ibn Saud. He had "gone native". The Secret Service, however, continued to pay Philby for another five years. Shortly after his resignation, Ibn Saud began to call for the overthrow of the Hashemite dynasty. Philby was able to advise Ibn Saud how far he could go in occupying all Arabia without incurring the wrath of the British government, then the principal power in the Middle East. By 1925, in the words of Philby, Ibn Saud brought unprecedented order into Arabia. Philby was put in charge of arranging Ibn Saud's coronation as king of the newly created state of Saudi Arabia. Philby settled in Jeddah and became partners in a trading company. Over the next few years he became famous as an international writer and explorer. Philby personally mapped on camelback what is now the Saudi–Yemeni border on the Rub' al Khali where 126 degree daytime temperatures are not uncommon. In his unique position he became Ibn Saud's chief adviser in dealing with the British Empire and Western powers. He converted to Islam in 1930. In 1931 Philby invited Charles R. Crane to Jeddah to facilitate exploration of the kingdom's subsoil assets. Crane was accompanied by noted historian George Antonius, who acted as translator. In May 1933 Standard Oil of California (SOCAL) concluded negotiations with Philby for a 60-year contract to obtain the exclusive concession for exploration and extraction of oil in the Hasa region along the Persian Gulf. This marked the beginning of the decline of British influence in the region and the start of American influence. The personal contacts between the United States and Saudi Arabia were largely channeled through the person of Philby. Meanwhile, at Cambridge Philby's son, Kim, was being recruited by the OGPU of the Soviet Union. In recent years the theory has been propounded that Kim was recruited in particular to spy on his father, who had such powerful influence over the founder of the Saudi state and its connections with Britain and with American oil interests. By 1934, in an effort to safeguard the port of Aden, Britain had no fewer than 1,400 "peace treaties" with the various tribal rulers of the hinterlands of what became Yemen. Philby undermined British influence in the region, however, by facilitating the entry of United States commercial interests, followed by a political alliance between the United States and the Saud dynasty. In 1936 SOCAL and Texaco pooled their assets together "East of Suez" into what later became ARAMCO (Arabian–American Oil Company). The United States State Department describes ARAMCO as the richest commercial prize in the history of the planet. Philby represented Saudi interests. In 1937 when the Spanish Civil War broke out, Philby arranged for his son, Kim Philby, to become a war correspondent for The Times. The same year Philby began quiet negotiations with Ben-Gurion to allow unlimited Jewish immigration to Palestine under Ibn Saud's protection. Later Philby began secret negotiations with Germany and Spain concerning Saudi Arabia's role in the event of a general European war. These discussions would allow neutral Saudi Arabia to sell oil to neutral Spain which then would be transported to Germany. John Loftus, who worked in the United States Department of Justice Office of Special Investigations Nazi-hunting unit, claims Adolf Eichmann, while on a mission to the Middle East, met with Philby "during the mid-1930s". At a February 1939 meeting in London with Ben-Gurion and Weizman, Philby offered substantial Jewish immigration to Palestine if they would support Ibn Saud's son and eventual successor, Faisal, as King of Palestine. Months later, accompanied by Saudi foreign affairs official Fuad Bey Hamza, Philby proposed to Weizmann and Moshe Shertok (later Sharett) that they pay Ibn Saud £20 million to be used to resettle Palestinian Arabs. Weizman said he would discuss the plan with President Roosevelt. Kim Philby also was present at this meeting. According to Philby the Zionist leadership accepted the "Philby Plan" in early October. However, because of the kingdom's special status as home of the Islamic holy places, the plan was denied when Philby leaked it. The matter was not taken up again for another three years. Meanwhile, Philby ran for election to the House of Commons for the British People's Party declaring, "no cause whatever is worth the spilling of human blood" and "protection of the small man against big business". He lost and soon thereafter the war began. Because of his activities he was arrested when he travelled to Bombay on 3 August 1940 under Defence Regulation 18B, and was taken to England. Friends such as John Maynard Keynes intervened, and after seven months he was released without prosecution. It is not known precisely who arranged for release. Shortly thereafter Jack Philby recommended his son Kim to Valentine "Vee Vee" Vivian, MI6 deputy chief, who recruited him into the British secret service. When Harold Hoskins of the U.S State Department visited Ibn Saud in August 1943, he asked if the king would be willing to have an intermediary meet with Chaim Weizmann. In anger Ibn Saud responded he was insulted by the suggestion that he could be bribed for £20 million to accept resettlement of Arabs from Palestine. Hoskins reports the king said Weizmann told him the promise of payment would be "guaranteed by President Roosevelt." A month later Weizmann, in a letter to Sumner Welles wrote: "It is conceived on big lines, large enough to satisfy the legitimate aspirations of both Arabs and Jews, and the strategic and economic interests of the United States; . . . properly managed, Mr. Philby's scheme offers an approach which should not be abandoned." When the war ended he returned to Arabia. In 1945 at the age of sixty he purchased his second wife, a 16-year-old girl, from the slave market at Taif, about forty miles south of Mecca. He continued work with ARAMCO. Talk in the king's circle was that Philby was an agent of British Secret service, a Zionist spy, and a communist. Philby began to provoke a series of spectacular arguments with the king. He claimed the disagreements were caused by the corruption and decadence that oil money brought the kingdom. ARAMCO learned from Philby a great deal about Arabia framed in a manner to strike a sympathetic response in the American people. ARAMCO and the CIA at the time were a revolving door for the same personnel. There were no other sources of information about Saudi Arabia available to the American public. It was portrayed as "a mirror image of the Old West, a wide, unfenced land where nature was unsubdued, religion was simple and fundamental, and the law of the gun prevailed—the desert of Arabia, as America's last frontier." Little was said of the fanatical nature of Wahhabism or its dark and bloody excesses. ". . . the true basis of Arab hostility to Jewish immigration into Palestine is xenophobia, and instinctive perception that the vast majority of central and eastern European Jews, seeking admission . . . are not Semites at all. . . . Whatever political repercussions of their settlement may be, their advent is regarded as a menace to the Semitic culture of Arabia . . . the European Jew of today, with his secular outlook . . . is regarded as an unwelcome intruder within the gates of Arabia". While in Beirut he reconciled with Kim, and the two lived together. The son was reemployed by MI6 as an outside informer on retainer, with the assignment to spy on his father. Jack Philby helped further his son's career by introducing him to his extensive network of contacts in the Middle East. Jack introduced him to President Camille Chamoun of Lebanon. Both were sympathetic to Nasser during the Suez Crisis of August 1956. Between Jack's access to ARAMCO and Kim's access to British intelligence there was little they did not know about Operation Musketeer, the French and British plan to capture the Suez Canal. The Soviet Union exposed the entire plan in the United Nations and threatened Britain and France with "long-range guided missiles equipped with atomic warheads." In 1955 Jack reconciled with the royal family and returned to live in Riyadh. In 1960, on a visit to Kim in Beirut, while in bed with Kim at his side, he said "God, I'm bored" and died. He is buried in the Muslim cemetery in Beirut. This page was last modified on 24 August 2016, at 07:28.